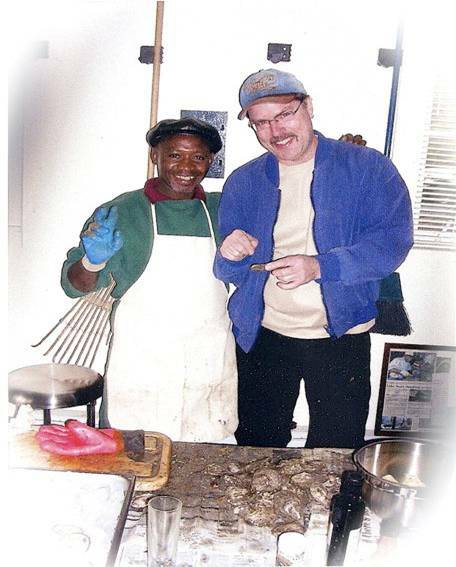 The original oyster roast was held at our home in Mayo, Md. It was probably 1990 or '91. I know I was still playing softball so I was still in my 30's. Anyway the whole concept of the party was to spend some fun time with friends from work, the ringers on the softball team, and their families without the added distraction of actually working or playing softball. Greg and I basically provided two boxes of oysters and beer. I have a vague recollection of grilling something. It was an incredibly hot day for November, 80 degrees. And an incredibly fun day. We just ate, drank and talked. Good times. So good we repeated it the next year, and the next, inviting more and more people until it got, well it got out of control. Too many people, too much work. So when Greg and I sold the house and moved to DC to the tiny townhouse the oyster roast was no more. SIDEBAR: We resurrected the party after we finished building the house on KI in 2001. The house was actually completed on 9/11/2001. I was at work in DC, looking at smoke rising up from the Pentagon across the river. Miche, our architect called me to discuss the paneling under the bar in the kitchen, the grain was running the wrong way. I said Dude, go upstairs and turn on the tv. We are being attacked. Miche and ____ spent the rest of the day, as did everyone else in the US, in front of the tv. The paneling is still there, sort of an homage to 9/11. BACK TO THE OYSTER ROAST: It was our housewarming party. We invited both our families, friends from our dating days, our architect, Miche Booz, the builders, new friends, friends from work. We bought the oysters from the Crab Shack here on KI, and Bob, the proprieter along with his wife Cherie, recommended an oyster shucker. It was a great party, lasting long into the night. We ran out of oysters too soon, but it was ok. So much fun for everyone to come and see our house, spend time together and eat, and eat, and eat. All the kids loved decorating pumpkins and bashing the piñata. That's Alvin Lake on the left (Greg is the white guy). Alvin is a champion oyster shucker with many trophies to prove it. Every year he participates in the Tilghman Island Oyster Shucking Contest, and every year he wins. He and his wife, Wanda, are great friends and they still come to every oyster roast. Sometimes Alvin's sister, another champion oyster shucker and crab picker, comes along. She loves Ina Gartin's sun-dried tomato dip! Wanda and Alvin's grandson is usually in attendance. He likes Coca-cola and listening to the guys play guitars. We are really lucky to have met Alvin and Wanda. Another thing that we all love about the oyster roast is the food. Kathey Moore, Greg's beautiful sister always makes the meatballs. Now these meatballs are not just any meatballs. The recipe originated with Laura Homer, my mother-in-law. The meatballs are highly coveted by the Homer boys. They never last very long. The recipe? Well the main ingredients are meat and love. And those damn milk lunch crackers which are no long available… I don't know what Kathey is using in their stead, but they are still just as delicious. And devoured in no time. Stacy, my sister in law married to Greg's brother Pierce, makes the like-wise coveted Pickled Shrimp, another one of Laura's recipes. They are too delicious. I will post the recipes on this page another time, if I get permission from the family, that is. I make pork chili verde. Pork, green chilis, garlic, onions, and a can of Rotel. I make lots of other things, but this is the dish that HAS to be made, along with meatballs and shrimp. Part of tradition. A new tradition, started two year's ago is Bob's Butter. Bob and Tammy Pitcher, our best friends, shared this recipe with us two years ago and we make it for every roast now. It's butter and herbs and spices and a little chili heat. Bill mans the grill, roasts the oysters and puts a pat of Bob's Butter on the hot oysters. Oh man, are they good! He can't make them fast enough. It's actually hard to get near the grill when they are cooking because the aroma of the oysters and butter draws a crowd.